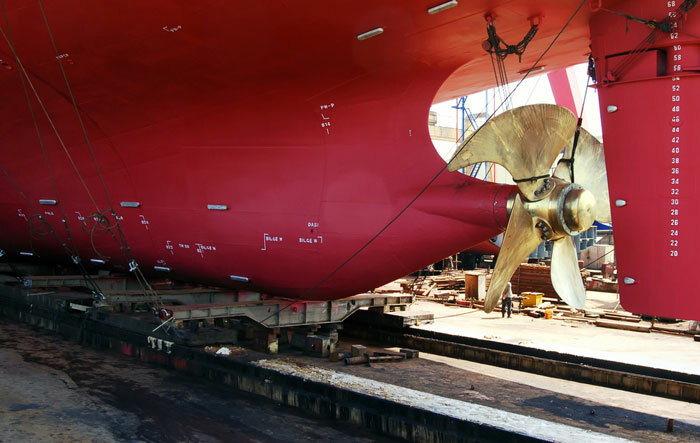 If you have the experience of dry docking of a ship, you would agree that dry docking is a great experience. I personally love to be on a ship due for dry dock. After all, you get to see things which you don’t see during routine operation of the ship. I was lucky enough to get a chance to be in dry dock in each rank I have served on. I was even lucky to experience the double-hull conversion of a tanker during dry dock. But if you have not been to a dry dock, there would be one thing that might come to your mind on hearing the word Dry Dock. And that is dry dock calculation that we read in ship stability, probably during our Mate’s exams. That’s purely theory part. And I believe theory without practical experience is just a theory. So here I am going to write about the practical aspect of taking a ship to dry dock. But before I proceed, in layman’s terms I will summarize what we had read about dry docking in ship stability. The time from “when Stern touches the blocks” to when “full ship is on the blocks” is the critical period. During the critical period, the vessel’s GM reduces. This is because vessel’s ‘Gravitational center G moves upwards when Stern touches the blocks. It is required and a good practice to have the least trim while docking so that the critical time is minimal. Well, I am not going to the company specific parts of dry docking, like preparing repair specifications. I will specifically be talking about taking the ship into the dock and making it sit on the blocks. And then, of course, bringing the ship out of dry dock. Days before the planned dry dock, Dock master will make the first contact with the ship. He can do so either directly or through the company representative such as superintendent. The dock master has a huge responsibility of calculating the stresses on the dock as well as the ship’s structure. Any miscalculation can lead to serious accidents resulting in huge damages. These damages can be to the ship as well as dock itself. 1) Hull structure so that he can arrange the blocks to support the ship’s hull. 2) locations of transducers for log and echo sounders so that these do not come beneath the blocks. 3) Location of sea chests and drain plugs for the same reason. Based on the docking plan provided by the ship, dock master prepares his own docking plan for the ship. 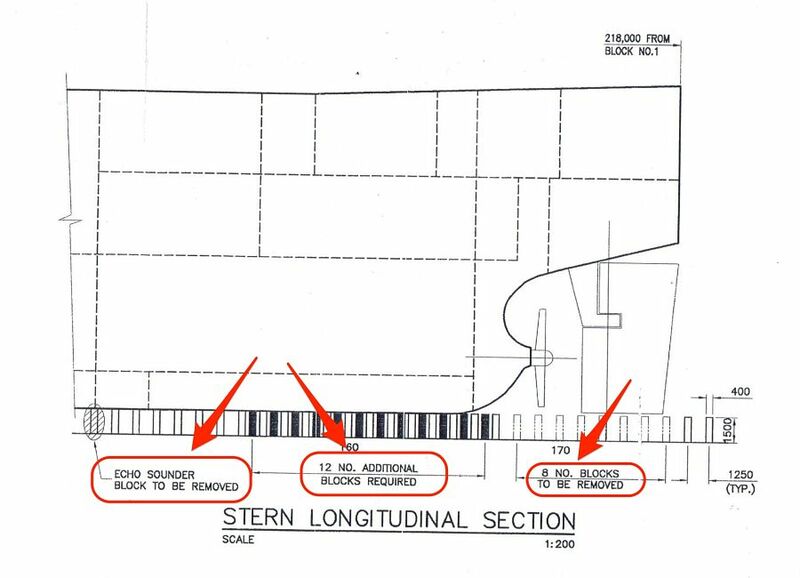 Below are some of the sections of actual docking plan prepared by dock master for s ship arriving for dry dock. As you can see, dock master has planned which blocks he needs to remove and where he needs to put blocks. He also has specifically marked the location of echo sounder and speed log. Have a look at the more closer view below, which is again from same docking plan prepared by dock master. 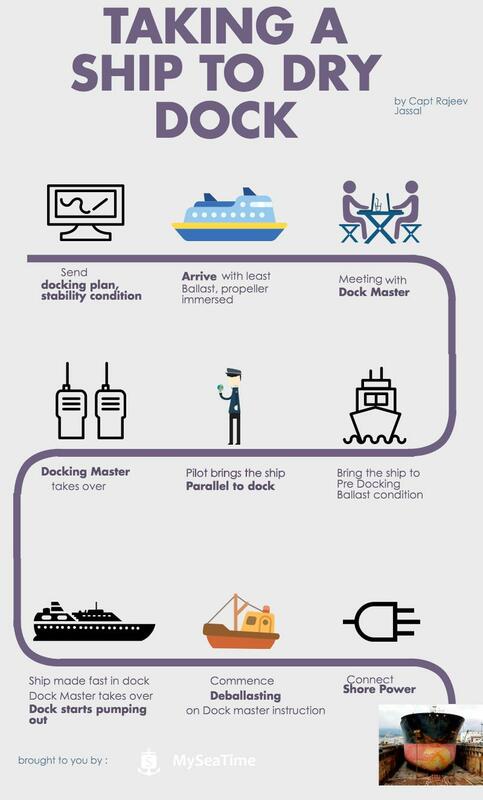 I think the above image make it more clear about what dock master is trying to achieve from the docking plan. If you want to see the stern view too. Here is it. And this is no theory. 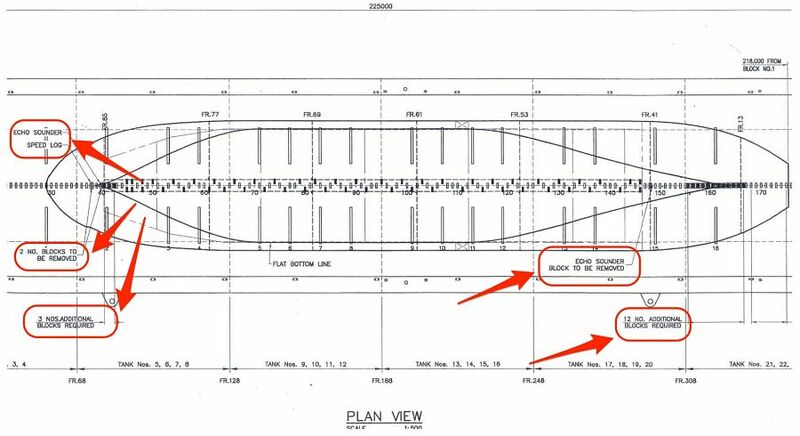 This is an actual docking plan prepared by dock master for a ship arriving at dry dock. I know I am kind repeating myself but I can’t say it enough. That is because I get excited to see real thing than just theory. Apart from docking plan, dock master would ask arrival weight distribution of the ship. On arrival dry docking port, you need to have least possible ballast. By least possible I mean, propeller should be immersed. And also you should be complying with all stability requirements. So we know that we cannot arrive with zero ballast as our propeller need to be immersed and the ship needs to be stable. But what is the logic behind having other three conditions? Why can’t we just remove all the ballast and go inside the dock? Docking with zero ballast is the ideal condition. But most of the times this would not be possible. That is because docking master would limit you for the maximum trim that you can have. In zero ballast condition, your trim may be more than 2 meters. Dock master would want you to reduce the trim to around 0.5 meters. This depends on the dock on how much trim you can have before docking. We have already discussed the reason for the need of least trim while docking. This is to have the least critical period. More trim we have more will be the time required to bring the vessel from stern on the block to full ship on the block. And this is the critical period with least GM value. 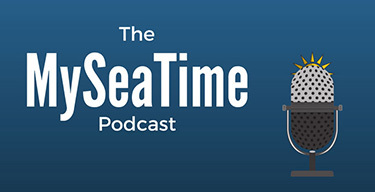 We do not want to have the ship in the critical period for longer time. Most of the ships will have considerable stern trim in light weight condition. So most ships will need to have some ballast forward in Pre-docking condition. The amount of ballast would depend on how much trim dock master has advised you to have. When the ship is on the blocks, you have already passed the critical period. Dock master will tell you to start deballasting. The only concern dock master will have is the ship should not refloat. The ship can refloat if dock deballasting cannot compensate for the decrease in the draft because of deballasting. The condition is monitored by the dock master and he would tell you on how much ballast you can remove in this condition. But the question is why the dock master need the vessel to remove the ballast concurrently when he empties the dock? This is because dock water does not want to have more weight on the blocks. When the ship is sitting on the blocks but has water inside the dock, there is a certain amount of buoyancy ship has. This buoyancy acts like upthrust which reduces the effective weight acting on the blocks. This condition will be discussed by the dock master and he will advise when and how much ballast you can remove. As I said earlier, dock master bases his calculations on not to allow the ship to refloat. When the ship is on the blocks and there is no danger of ship re-floating, dock master will tell to take out all ballast. Dock masters sometimes call this condition as the Dry condition. Now that we know about the stability part, let’s look into each stage of taking the ship to the dry dock. As I mentioned, you would arrive with least ballast. That would be arrival dry docking port condition. Even though the ship will be complying with draft and stability requirements, but the ship will be light. Lighter than usual ballast condition. So before you arrive at this condition, it is important to scan the weather reports. You would not want to arrive in light condition if the weather prediction is rough. Most of the time, the ship is taken to the lay-up berth before going into the dry dock. If not, vessel needs to be at anchor for deballasting to arrive at the Pre-docking condition. While at anchor, dock safety inspector will board the vessel. He will do the gas check of all the compartments to make sure that vessel is gas free. He will then issue a gas free certificate. He will also give safety booklet of the dock which will have all the safety regulations of the dock. The vessel will dock when it has achieved the pre-docking condition. In this condition, vessel will have least ballast to achieve the required trim. Before docking, dock master will board the vessel. He will discuss the docking procedures with master and chief officer. He will give the mooring arrangement plan while docking. He will specify the Panama leads from where the moorings will be passed. Apart from this, he will also discuss the ballast condition at each stage. For shifting to the dock, the pilot will board the vessel. As the ship’s engine will not be available, the ship will have a number of tugs to move the ship to dry dock. The number of tugs would depend on how big the ship is and how powerful the tugs are. In any case, all ships can expect 5 tugs or more. Out of these 5 tugs usually, 2 will only be assisting for pushing. Different docks can have different arrangements for making fast the tugs. It will all depend upon the location, tidal current, and local factors. One of such arrangement can be two tugs made fast forward, one made fast aft and two tugs standby. The one tug made fast aft will have one line on each side of the poop deck to have better control in handling the ship. Depending upon the dock, the ship will either enter stern in or bow in. The pilot will bring the ship parallel to the dock. When the stern (or bow whichever is entering first) is close to the dock knuckle, docking master will take over from the pilot. Docking Master is different from dock master. Docking Master may not board the vessel and will be giving instructions to the tugs from the dock itself. When the ship is inside the dock, ship’s crew need to pass the mooring lines as per the agreed mooring arrangement. Usually forward and aft will have two lines on each side. Out of two lines on each side, one on each side can be shore line. But this can be different and mooring arrangements will be advised by the dock master. When the ship is made fast with the moorings, docking master will sign off and dock master will take over. Before dock master starts to remove dock water, a diver will make an underwater inspection. The diver will ensure that echo sounder and log sensors are clear and not sitting under the blocks. 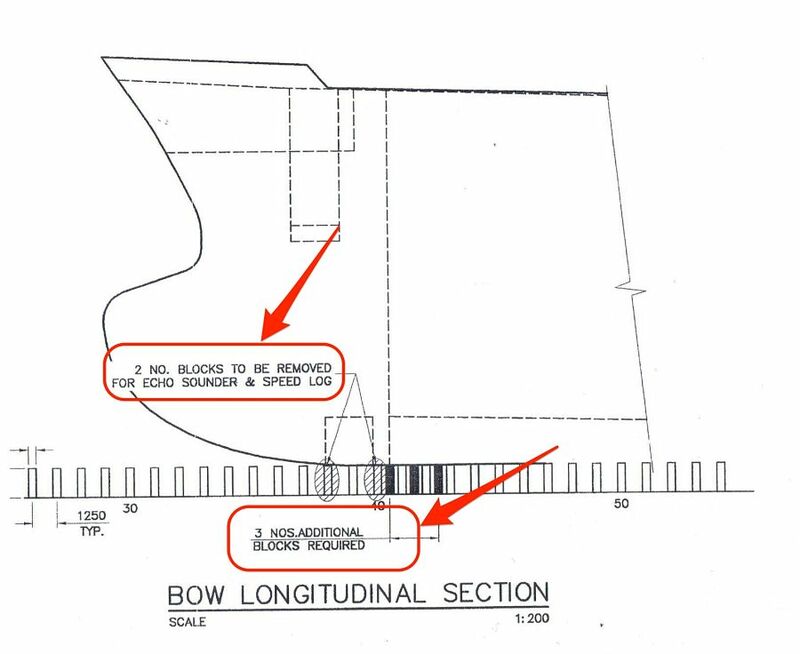 He will also ensure physically that vessel’s centerline is in line with the blocks. It is a good practice to switch off the echo sounder and speed log now. After the diver has made his inspection, dock master will start pumping out dock water. Dock master will let the vessel know when Stern has touched the blocks and when the ship is on the blocks. After the ship is on the blocks, dock master will tell to start pumping out ballast to arrive at the wet condition. As the dock water is being pumped out, at one point the water will go down from the generator cooling water sea chest. After this point ship will get power supply from shore. A shore electrician will board the ship (Through basket and shore crane) and make arrangement to connect the shore power. Ship’s Electrician should coordinate with him to have the shore power connected. You should check if shore power will be enough for running the ballast pump and mooring winches. If not, this should be discussed with dock master in advance. He will then ensure that water level does not go below sea chest until you have pumped out required ballast. Once on shore power, dock master would continue to dry the dock. He will tell you to take out all ballast accordingly. You may do so with gravity as same might be more effective. Once the dock is dry and ship sitting on the blocks, you can line up to deballast all ballast tanks by gravity. This is to let all the water drain whatever is left in the ballast tanks. So now you have already brought the ship to the dry dock. It is a wonderful view to see the ship out of the water. You should not wait to go down in the dock and have a look at her. The Ship repair manager will now request the chief officer to witness the removal of the bottom plugs. As you know, each tank which forms part of the hull has a bottom plug to drain the water in dry dock. Removing bottom plugs ensure that the tanks are empty and dry. As bottom plug of each tank is removed, it is important to label it. This will ensure that bottom plugs are not interchanged while fitting back. Though plugs of all the ballast tanks are of the same size, it is best practice to fit back plugs which belong to each tank. If you wish to experience how we remove the bottom plugs, watch this video. After few hectic days in dry dock, it would be time to leave dry dock. We need to be equally attentive in leaving the dry dock as we were while coming into the dry dock. Before dock master floods the dry dock, all the underwater things need to be in order. This includes sea chests, ICCP system, echo sounder sensors, log sensors and drain plugs. Echo sounder, log and drain plugs are tested for air and water tightness. Testing involves first putting soap solution around the drain plug. Then we create the vacuum around drain plug and look for any bubbles. If you have never experienced this testing before, here is a video of testing of the drain plug. After all these integrity tests are complete, it is time to leave the dry dock. The best approach of leaving the dry dock is to follow exactly how the ship came into the dry dock. Filling the ballast to bring the ship to wet condition. Flooding the dock up to the level where the ship is fully afloat. Taking the ship out of the dock with the help of tugs. Dry docking is a great experience for those who do not want to stop learning. The special thing about dry docking is that there are plenty things that a seafarer can learn each time he attends a dry dock. While it might seem to be a difficult process but if we view the whole process logically, it would seem a routine. If you are going to a dry dock, Enjoy the learning process. And let me know in the comments below if there was anything that should form a part of this guide. A wonderful explanation Sir , though I haven't got a chance to be at drydock , but I could Imagine the process .. Thanks. Glad you liked it Anooj.. Very informative. I now have an good understanding of what can be expected when it comes to Dry Docking. Loved your web blog and its excellent. Glad that you liked it Rag..
Glad you found it useful Lokesh.. Although the principal of testing a bottom plug is the same, the video above is actually a vacuum test to ensure that a transducer head (most likely an Echo Sounder) is properly sealed. You are absolutely right John. Awesome sir, i found it very much useful during drydock of NCC ABHA. It was my first drydock. Glad you liked it Amin.. I will include that in one of the future blogs Ankit..
Glad you found it useful Ramamurthy. I have one post on ship structures. Hope that could be of some help. very informative and great article for orals prep ! Glad you liked it Abhimanyu..
A very good and concise explanation especially for crew going to dock for the first time. Thank You very much sir for this wonderful article. 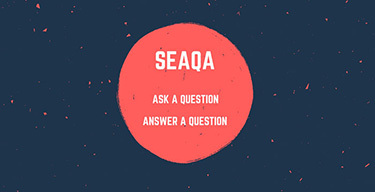 Immensely helped me while answering my mates orals. Had never been to a drydock but could visualize perfectly. Glad that it could be some help to you Swapnil.. Thanks a ton for the article sir.Can you tell me the name of the instrument which does vacuum test of bottom plug? There is no special name for this. It is simply called "Leak Test Vacuum box". Sir can u pls tell me how come dock master will know that ship bottom had touched the blocks,What are the methods? He knows the height of the blocks and when the draft of the ship is equal to this height, he would know that ship has touched the blocks. In case of floating dock, he will notice the additional weight on the online loadicator of the dock. Thanks Satish. Glad you found it interesting..
Sir,this an awesome post as the others from you,very helpful for orals.Can you post something simple regarding stability,it would be quite helpful.Thanks. Glad you liked it Soumen. I will write on stability soon.. It is not the dock master alone that would be responsible but the dry dock company. In case of fatal accidents, the ship owner might appoint a maritime lawyer and make monetary claims for the family of the seafarer. Glad you liked it Neeraj..
Dock master will advise when to start the deballasting. It is started when ship is aligned to the blocks. Dock master will advise to keep the minimum draft to keep the A/E running. When the shore supply is connected he will advise to keep on deballasting. Good day sir. Maybe i'm off the point a bit but what usually happens with staff members during a dry dock period of 2 to 3 weeks? For example on a cruse ship with hundreds of employees from all over the world. The required staff stays onboard. I do not know about cruise ships but I guess the catering staff and all other staffs required for passengers are sent on leave and staff responsible for the operations of the ship remains on board. Excellent blog....Sir. Accidentally stumbled upon this blog and though not connected with Marine Engg. ; enjoyed reading.. Am basically a Mech. Engr.... enhanced knowledge. I'm glad to find this blog, I loved your complete explanation, it made it all clear for me . Thank you. m making presentation on dry dock u made my job a piece of cake with this data . well explained and you made others realize that its not just sailing a ship into the sea. Thank you very much for such a detailed explanation. Sir, It is possible to Dry dock a ship with trim by head?? Nice article. During dry docking what is the normal procedure for the electronics. Will the AIS, radar, etc be turned off? Thanks again! 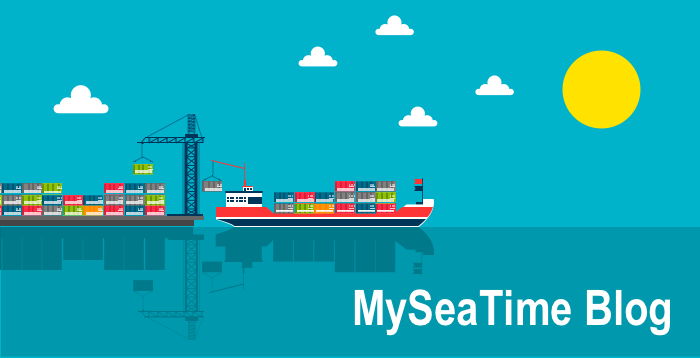 There is no such requirement but if any yard specific requirement, then yard safety officer will let the vessel know in advance..
Thnks for the vast imformation,So every time the new ship come,we can arrange the block according to that ship?? Excellent sir. This is the best article written in excellent and simple way. I just very happy. 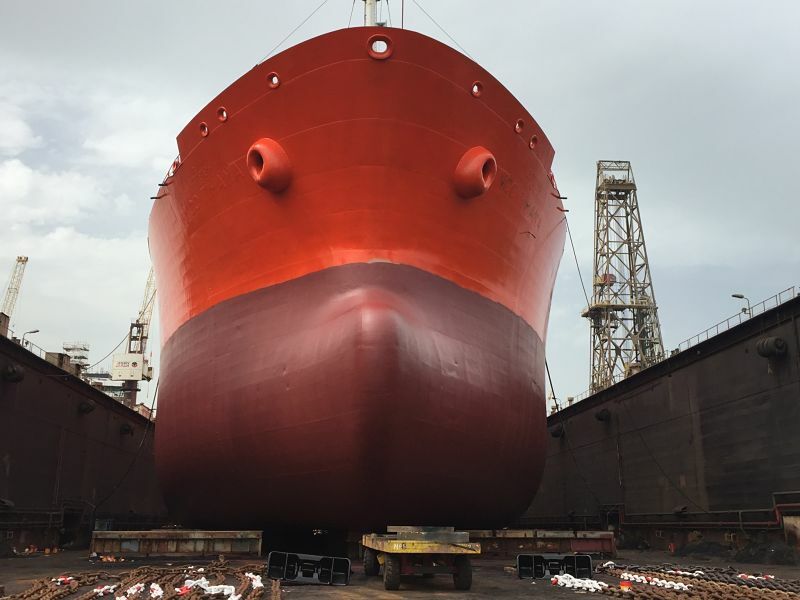 Excellent article, there is a repeated question asked in Master exams, How will you drydock a vessel with forepeak in damaged condition?? Hello, Good day Sir, My question is wrt stability prospects, where will be P when the vessel is sitting all over the blocks. This is a question frequently asked in MMD orals for Master candidates. Thank you in advance. Good day Sir, I have question regarding Crude Oil Washing for Crude OIl Tankers entering DD. Is there any specific requirement for Amount of Water used and No of minimum cycles to be carried out before entering DD.? Very informative and detailed explanation sir. We can find the theory part on other parts but all the topics disccused bu you are added with practical knowledge and its implementation. Very informative and detailed explanation sir. We can find the theory part on other sites but all the topics disccused bu you are added with practical knowledge and its implementation. Awesome sir. I can't explained you. Just one word- mind blowing. Sir i have one question to you. What is the name of Special keel block use in dry dock with loaded cargo?? Comment* Thanks for your effort, very useful informations. God blessed you Sir. Very well explained about Docking and Undocking of a vessel. But if possible, can you pass information regarding vacuum test of drain plugs before undocking. PLEASE ADVICE ON BELOW QUESTION FOR WHICH IS FREQUENTLY ASKED IN ORAL FOR MATES & MASTER. MAINTENANCE ON ANCHOR & CHAIN LOCKER IN DRY DOCK? beautifully explained,vodeo is real spice to the contents. very good explanation especially for crew going to dock for the first time. capt.rajeev, thank you for such beautiful explanation. can you please explain procedures for dry docking with forepeak tank ruptured.